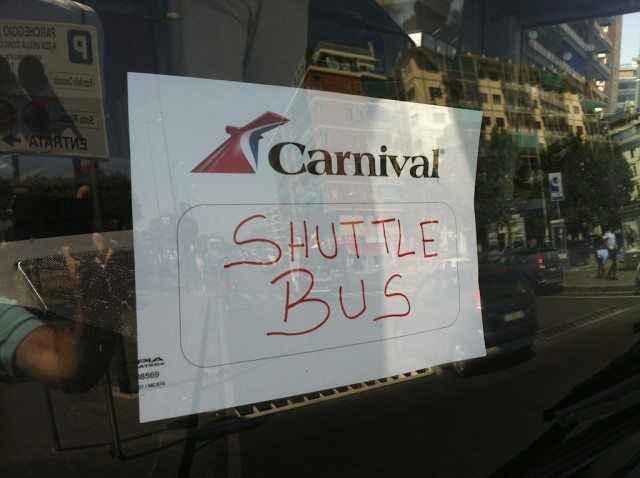 Scads of fun at 130,000 tons and carrying some 3,690 passengers double occupancy, Carnival Breeze represents where Carnival Cruise Lines is headed as it executes Fun Ship 2.0 across its fleet. 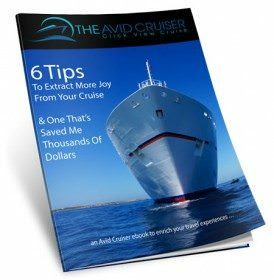 Purchase our new Carnival Breeze Review iBook for $1.99 at this link. If something goes awry with the link, just open iTunes or the iBooks store and search for Carnival Breeze Ship Review. 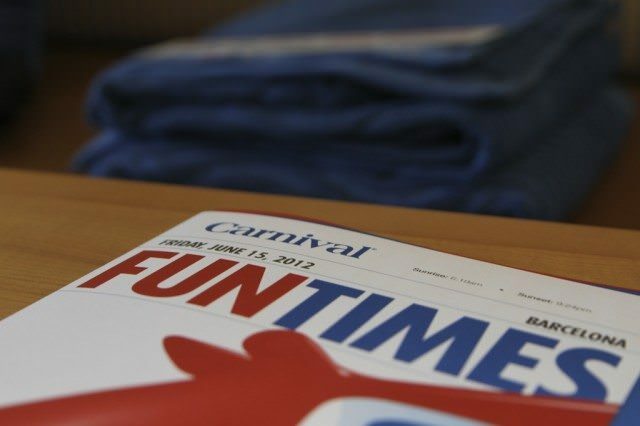 Introduced in June 2012, Carnival Breeze is the newest example of the $500 million fleet enhancement program that will transform the line’s on-board experience through branded spaces and celebrity partnerships. The initiative on Carnival Breeze includes partnerships with George Lopez, who serves as the line’s creative director for comedy to enhance the fleetwide Punchliner Comedy Clubs; and Food Network personality Guy Fieri, who developed a new free burger venue called Guy’s Burger Joint; as well as top brands such as Hasbro. New food and beverage concepts round out the mix, such as the poolside RedFrog Rum Bar, BlueIguana Tequila Bar and BlueIguana Cantina, along with entertainment choices and Playlist Productions and a partnership with celebrity song master DJ IRIE. With Carnival Breeze, Carnival executives say the company is returning to its roots of being a “Caribbean centric” cruise line, a “fun and sun brand at its core,” and the new ship’s design reflects that. That’s why Carnival is emphasizing the outer areas of Carnival Breeze, as Carnival passengers have indicated that they want to feel the essence of the sunny climates where Carnival ships sail — and not be clammed up indoors. In designing Carnival Breeze, the company created a few more outdoor spaces. You’ll find one example at Ocean Plaza, which has the Plaza Bar, The Taste Bar and Plaza Café on deck five. The latter serves speciality coffees and teas as well as pastries and other confections. Ocean Plaza has more outdoor seating than on Carnival Magic, which had hot tubs where additional seating is now on Breeze. Don’t worry, the hot tubs aren’t gone; just moved farther aft. 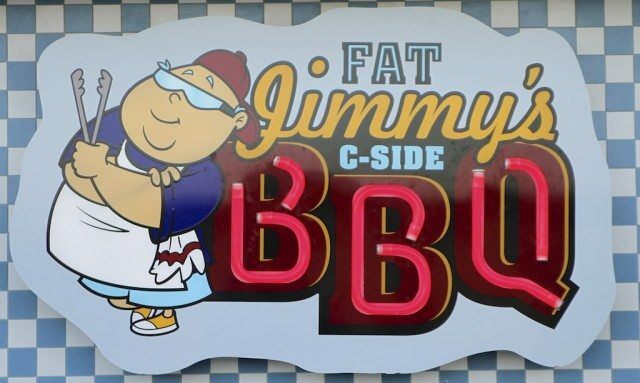 Adjacent to Ocean Plaza’s outdoor seating is a new outdoor dining venue called Fat Jimmy’s C-Side BBQ. 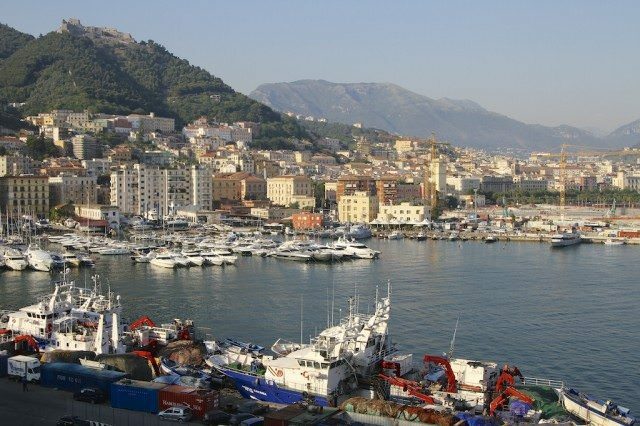 Open only on sea days and only for lunch, the complimentary barbecue restaurant serves a second purpose that is increasingly important to Carnival, and that is to disperse passengers so that Breeze feels less crowded than Magic. However, expect to stand in line for at least 15 minutes. Some passengers we talked to said it took them more than 30 minutes to have lunch at Fat Jimmy’s. Management may correct the problem, but for now, Fat Jimmy’s is too popular. 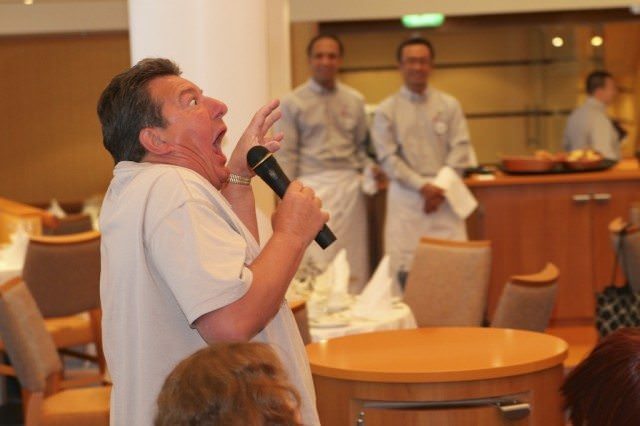 Likewise, a new Punchliner Comedy Brunch, served in the main dining room from 9 a.m. until 1 p.m. on sea days and also free of charge, attracts as many as 1,000 guests who come to dine and see the five- to six-minute comedy performances each hour. So theoretically, with 2,000 people dining in the new venues on Breeze, the Lido Marketplace should be only half as crowded as it is on Carnival Magic. The problem for now is that the new venues, especially Fat Jimmy’s, are too crowded. In addition to the dining venues mentioned, Carnival Breeze features the new Bonsai Sushi, which offers a la carte pricing ranging from $1 appetizers to a $15 sushi boat for two (I tried it and thought it to be a good value.) 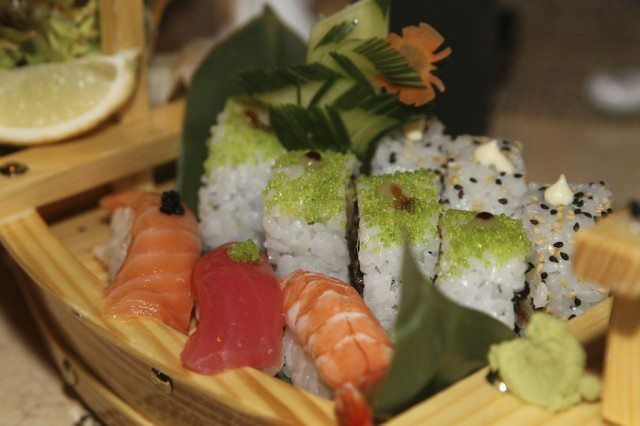 Bonsai Sushi is Carnival’s first full-service sushi restaurant. Fahrenheit 555 Steakhouse is a classic American-style steakhouse. Carnival recently upped the price from $30 per person to $35 per person for the four-course dinner. 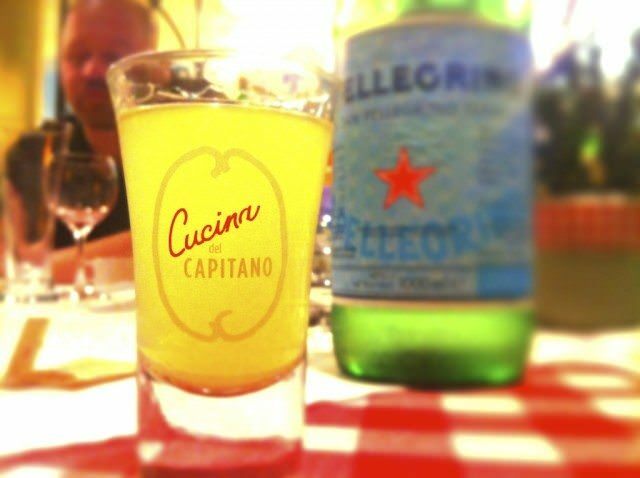 Cucina del Capitano brings home the Italian heritage embedded in the DNA of the Carnival brand. Situated aft on deck 11, the restaurant feels like an Italian home, featuring checkered table cloths, classic, family-style dishes and singing waiters. Cost: $12 for adults; $5 for children. A Chianti cart will pass by your table offering the Italian wine for $5 a glass; or $26 for a carafe. 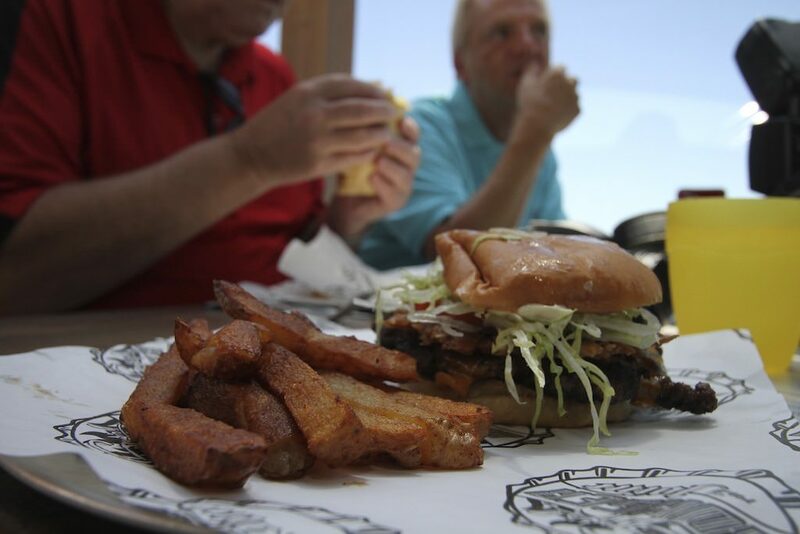 Guy’s Burger Joint, midship on deck 10, is modeled after a roadside burger restaurant. The outdoor venue offers signature burgers by the Food Network’s Guy Fieri, free of charge, as well as an expansive condiments bar. Note that burgers are only cooked well-done, so if you prefer anything less than that, you’re out of luck. 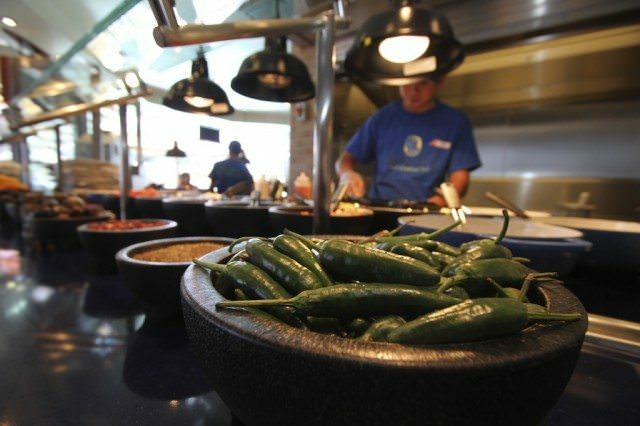 Avid Cruiser Breakfast Tip: BlueIguana Cantina is also open for breakfast. And as with lunch, burritos are made to order with homemade whole wheat tortillas and fresh ingredients. 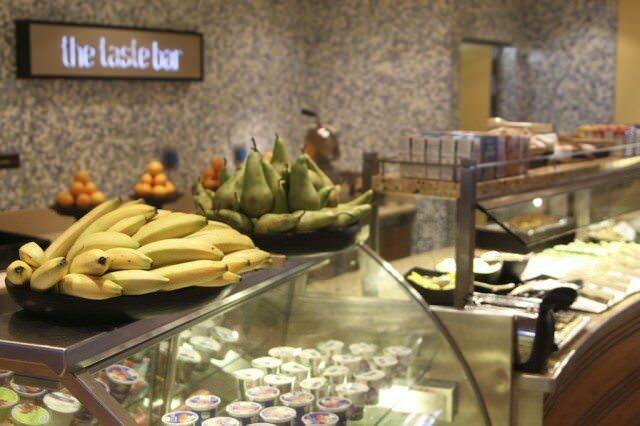 I enjoy a light breakfast — oatmeal, yogurt and fresh fruits — which can be had at Ocean Plaza on deck 5. Specialty coffees and teas are also available at Ocean Plaza for a fee: $4 for a grande latté, for example, with tip included. Most of the ship’s entertainment venues reside on Decks 4 and 5, making the area especially conducive for bar hopping and strolling. RedFrog Pub, situated on deck 5 midship, follows the success of the concept that originated on Carnival Magic. The pub is where Key West meets the British West Indies. RedFrog Pub serves island-inspired snacks (for a fee) and beverages, including ThirstyFrog Red Beer. The Library Bar on deck 4 forward is geared toward those who appreciate a quiet and intimate cocktail lounge. The bar has a great selection of dark spirits, plus automatic wine machines that dispense 2, 4 and 6 ounce servings for a fee. Liquid Nightclub on deck 5 aft offers a South Beach (Florida) style nightclub experience. DJs on Carnival Breeze are trained under the new “DJ IRIE Spin’iversity” led by the award-winning DJ IRIE, a disc jockey widely known in Miami and Las Vegas. Piano Bar 88 is a tad more elegant and interactive than the piano bars throughout the rest of Carnival’s fleet. 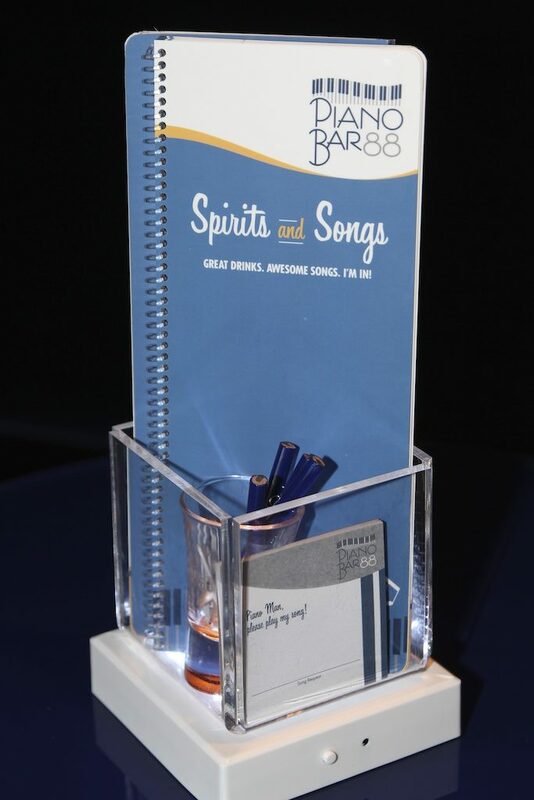 One new feature: Songbooks and request forms are on each table so that it is easer for guests to put in requests. On deck 10, the RedFrog Rum Bar specializes in frozen rum drinks, while the BlueIguana Tequila Bar specializes in frozen margaritas, hand-crafted tequilas and Mexican beers. 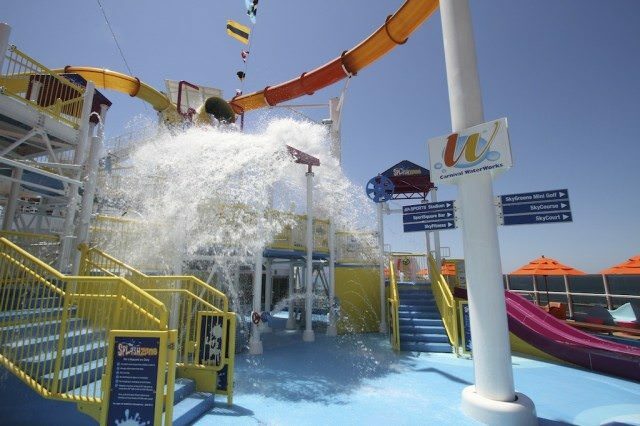 The Deck 10 pool area is a hub of skimpy bathing suits, cold drinks and fun contests, while the kids are catered to on Deck 11 in the Breeze’s city-sized Camp Carnival play area for ages 2 to 11. Other parts of the ship coddle tweens (ages 12–14) and teens (ages 15–17) with dance floors, Wii video games and more. There are also outdoor “Dive-In Movies at the Seaside Theater,” with blankets and free popcorn. 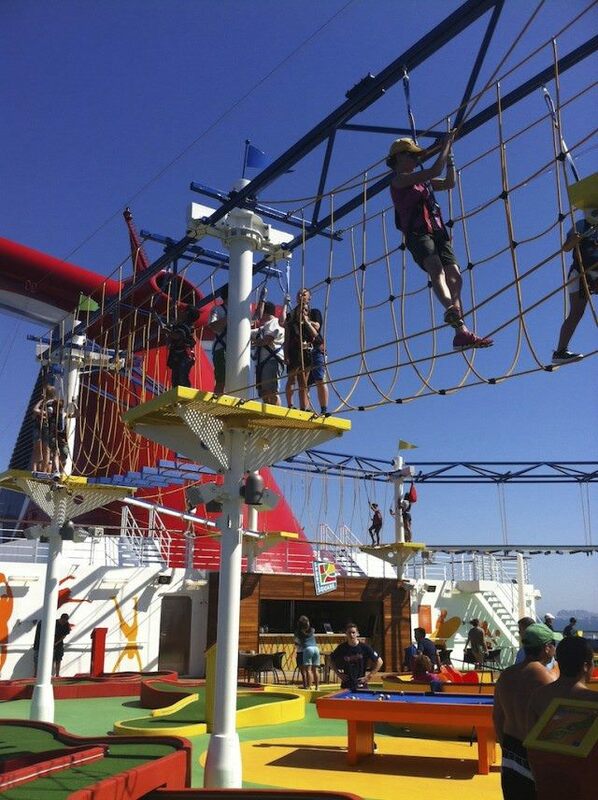 At SportsSquare, Carnival Breeze has the ropes course (SkyCourse) that was introduced on Carnival Magic, where guests can strap into a safety harness, choose between beginner or intermediate courses, and work their way along 230 feet of rope bridges, swinging steps, and beams suspended above the top deck. 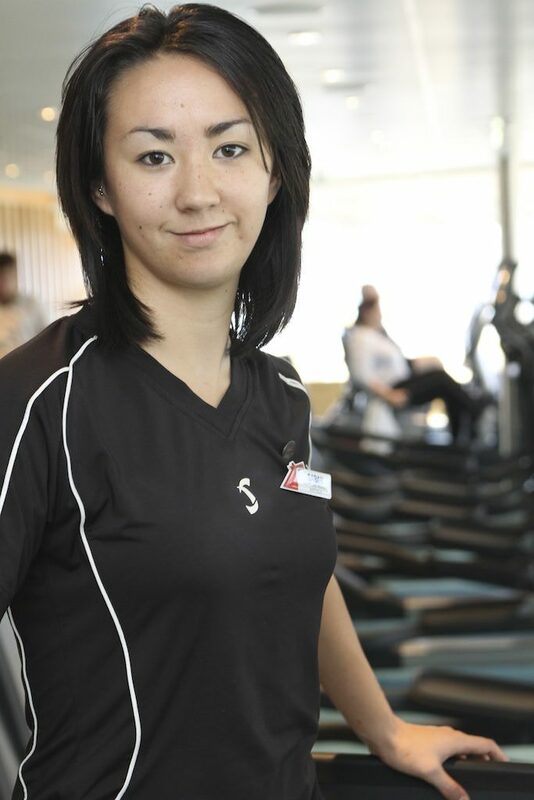 There’s also a jogging track, sports court, foosball and two-level miniature golf. 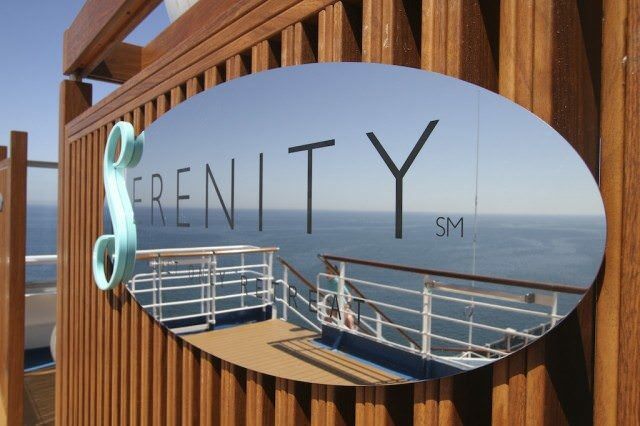 The Cloud 9 Spa and an expanded gym take up the forward section on three decks, and include the adults-only Serenity outdoor relaxation space with chaise lounges, chairs and hammocks (get there early to grab one). There’s also dining at Serenity, with salads, wraps and other light fare. 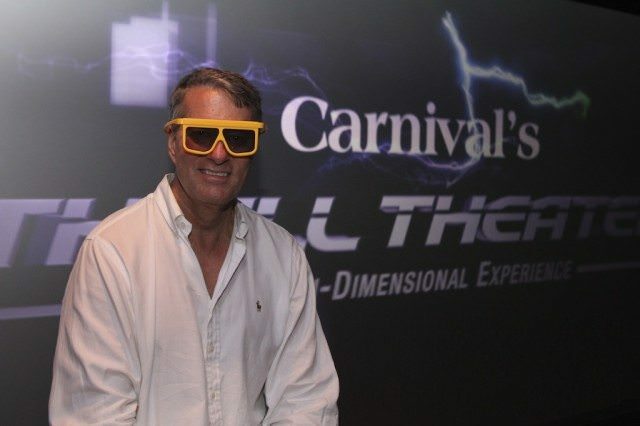 Carnival Breeze is the first ship to feature all of the new entertainment offerings that are part of the line’s “Fun Ship 2.0” initiative as well as the first in the fleet to debut the new Thrill Theater, an interactive, multi-dimensional experience. The Avid Cruiser gets ready for the excitement of the Thrill Theater on Carnival Breeze. The 24-seat theater combines a high-definition projection system with elements such as squirting water and bubbles, and original special effects that tickle guests’ legs, blow air on their necks and poke them in their seats. Seats within the theater shift back and forth, move from side to side and also vibrate. I found it to be fun, and there was lots of laughter. Cost: one show, $7.95 or purchase a package for the cruise for $14.95 per person. Carnival Breeze is also the first ship to offer Playlist Productions, high-tech production shows that combine live performances with LED staging and special effects. Four revues are currently offered – “Divas,” “Latin Nights,” “Motor City,” and “The Brits!” – each featuring popular and memorable music encompassing a variety of styles, genres and eras. Also on Breeze: Hasbro, The Game Show, based on the popular Family Game Night television series produced by Hasbro Studios and seen on The Hub, a network for children and their families; and “Punchliner Comedy Club Presented by George Lopez,” a partnership with the popular comedian and TV personality. Lopez serves as Carnival’s “curator of comedy,” acting as a consultant on the vetting and hiring of comedic talent for the line’s hugely popular comedy program. Breeze also has a grand three-story show lounge. 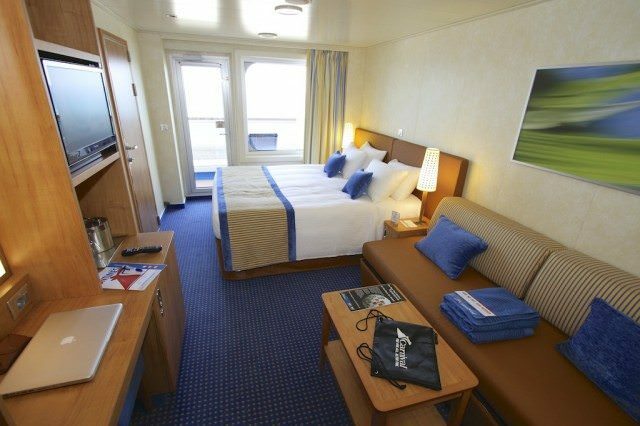 As aboard Carnival’s other ships, Breeze’s cabins are roomy, with standard inside cabins measuring 185 square feet and outsides a generous 220 square feet (part of that is the 35-square-foot balcony, however). All sport comfortable bedding, plus a TV, minibar, hair dryer, small sitting area, and bathroom with shower. I would recommend either one of the five-berth, two-bathroom staterooms or adjoining staterooms for families of four or more, especially if you want to be on speaking terms at the end of the cruise. I did find that the rooms could be a bit noisy. I heard my next-door neighbors quite often through the door to the adjoining staterooms, so be careful what you say if you’re in one of those. Also, stateroom doors slam hard enough that I never needed my alarm clock in the morning. I was awakened more than once by the constant slamming doors as people left to go on their morning shore excursions. A range of higher-category cabins and suites, including the Cloud 9 spa cabins, offer even more amenities and space. For something different, check out the Cove Balcony cabins, set down near the waterline — reminding you that you really are at sea, even on this giant ship. While cruising from Barcelona to Venice, ports or ground operators typically offered shuttle service that charged between 5 euros and 8 euros per person for transfers between the ship and the city centers. Transfer vouchers were good for both ways and for multiple trips in most ports. If you’ve been on Carnival Breeze, please tell us what you think in the comments section below. 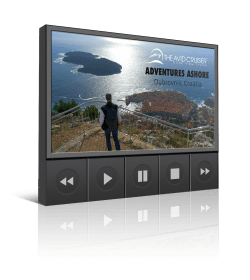 NEW iBook: Carnival Breeze Ship Review, Would You Pay $1.99? Magic Moments On A Cruise: What Are Yours? 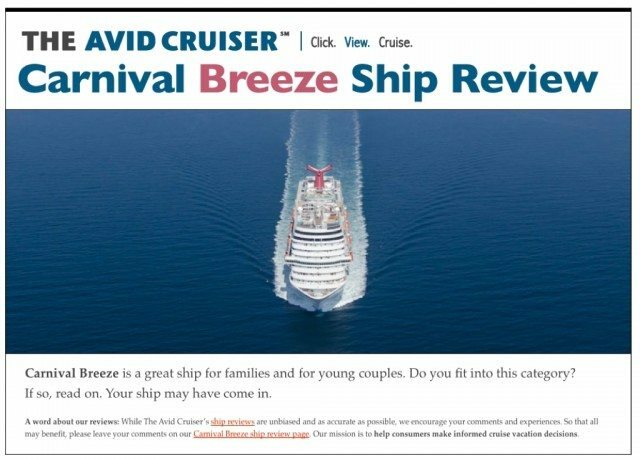 My kids and I sailed on Carnival Breeze last spring. We had a ball…there was never a dull moment! My kids loved the arcade, 4D theater and buffets of food. This was their first cruise and it did not dissapoint! Hi, trying to figure out if I should buy the pass for unlimited movies at the theater, which movies played while u were on board? thanks!!! I think you should definitely purchase the pass…it’ll be worth it! The 4D theatre features short SpongeBob films and other animated funny and fun movies. My kids (9 and 11 at the time) went everyday, all the time! I even went once with my sister and we enjoyed it too.